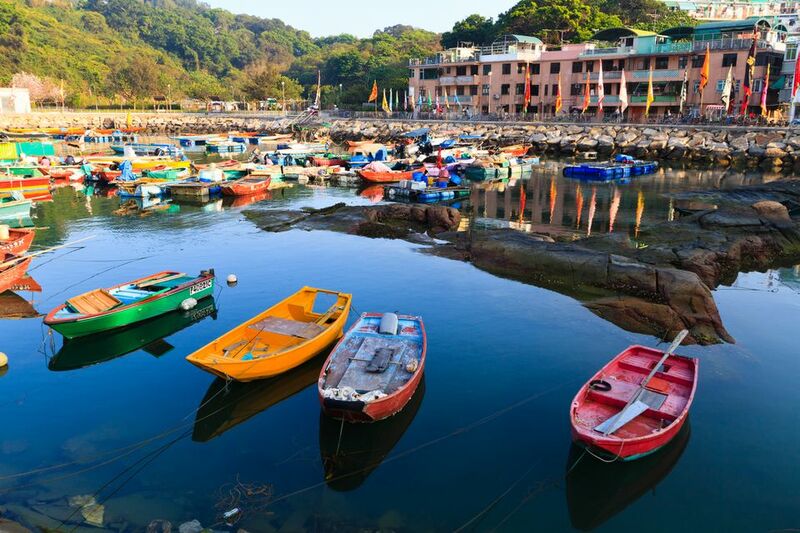 Cheung Chau Island has long been one of Hong Kong’s most popular island retreats. Smaller than Lantau but bigger than nearby Peng Chau, Cheung Chau is several gears slower than the big city but offers more to do than clamber around on rocks and play castaway. For many, Cheung Chau’s attraction has as much to do with its no-nonsense village lifestyle as with the sea and sand. While tourists are increasingly discovering the island, this island of 20,000 residents has lost none of its charm. Fishing boats still ply the harbor, while the waterfront Praya bustles to family-run grocery shops and clicking mahjong tiles. The only nod to tourism is the waiters washing down plastic chairs and tables for the evening rush. Cheung Chau has some of the best seafood in Hong Kong. In truth, it's easy to while away an afternoon sipping ice-cold beers and digging into freshly caught razor clams and salt and pepper squid in the handful of simple bottle bars lining the seafront. However, the island does have a few destinations worth exploring. Undoubtedly the island’s most famous sight is Cheung Po Tsai Cave. It’s said Cheung Po Tsai was a pirate who sailed the South China Seas and Pearl River Delta pillaging villages, terrorizing locals, and swigging rum. Given the area’s history, it’s a very plausible story. Unfortunately, a cave is a cave, and there’s not a great deal to see here. More interesting are some of the hikes that take in Cheung Chau's natural rock sculptures—somewhat of a Hong Kong obsession—as well as local temples. The Mini Great Wall in southeast Cheung Chau is worth a few hours of walking. Despite the grandiose name, the wall is actually a path, but it takes in some stunning vantage points over the South China Sea. Many of the wind-beaten rocks along the wall have been molded by the weather into natural shapes, including Flower Vase Rock and the more impressive Human Head Rock, which sports a pair of ears and a nose. Cheung Chau is blessed with a curtain of golden sand, and there are a couple of fine beaches. The most popular is Tung Wan, which has beautiful sands, full facilities, and can be full to bursting at weekends. It also has a dedicated windsurfing school. For something more secluded, walk a little further to the small but picturesque Kwun Yam Wan beach. As with much of Hong Kong’s island dining scene, seafood rightly dominates. It's hard to recommend a particular restaurant as you’re unlikely to have a bad meal and prices are generally cheap. Most of the seafood restaurants can be found down by the waterfront, and the best advise is to look for a restaurant busy with locals. Cheung Chau’s annual dance in the limelight, the Cheung Chau bun festival, is hands down one of the world’s oddest festivals. Each year thousands of locals and tourists alike gather to watch hundreds of participants claw their way up the side of a 60-foot ‘bun tower’ and pluck off bags of plastic buns. Swing by to taste local delicacies, watch dragon dances bustling through the streets, and party with locals in carnival mood until the wee hours. Hong Kong has plenty of festivals, but this rates as one of the best. For the sightseer, there isn’t much to keep you on Cheung Chau overnight, but, if the laid back atmosphere is inviting you to linger, try the Warwick Hotel. This slightly dated, concrete block isn't up to the standards of the three-star hotels back on Hong Kong Island or in Kowloon, but that’s part of its charm. Alternately, you can stay on Lantau Island and take a kaido water taxi across to Mui Wo. There are regular ferries from Central ferry piers to Cheung Chau. They run at 30-minute intervals and take around an hour.